Internet marketing is a fast-paced and dynamic industry that is ever changing. 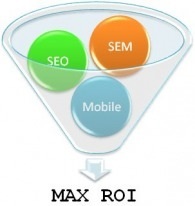 Online marketing is measurable and track-able unlike traditional marketing. It is important to stay ahead of the curve and that is where we excel. With industry leading technology, IMM is always offering our clients new ways to grow their business through the internet. We work with you to develop an online marketing strategy based on proven results. Our comprehensive online marketing strategies are designed to effectively target your customers, gain visibility, acquire revenue and take your business to new heights.